���� Mike Oldfield began his musical career in the late sixties playing folk and acoustic pieces which explored moody and lengthy instrumentals that would foreshadow the style of his 1970s compositions. After involvement in a number of bands including collaborations with his sister and brother, Oldfield joined the band The Whole Group who were backing vocalist Kevin Ayers. It was during this period that Oldfield composed and made a demo tape of an early version of Tubular Bells. Record companies were not interested in the tape until Richard Branson, who was setting up the Virgin Records label, saw potential in Oldfield and enabled a new version to be recorded in 1972. The Tubular Bells album was released in 1973 with the subsequent critical and sales success proving ground-breaking for both Oldfield and the fledgling Virgin Records label. After fifteen more albums over nearly twenty years artistic differences with Branson and the Virgin label led Oldfield to join Warner Brothers in 1992. This period produced a further eight albums including Tubular Bells II and III. Since 2004 Oldfield has been with the Mercury Records label and has recorded another two albums. ���� In this concert recording from the 1981 Montreux Jazz Festival Oldfield features songs from the then current album QE2, and its predecessor Platinum. As you�d expect his most famous composition Tubular Bells also features. Playing in this smaller venue Oldfield utilised a stripped down band with two drummers/percussionists (Mike Frye and Morris Pert), bass guitarist (Rick Fenn), keyboardist (Stephen King look-a-like Tim Cross) with himself on lead guitar and keyboards. Also joining him on stage is vocalist Maggie Reilly who had been a frequent collaborator with Oldfield in a number of album and single releases. The intimate atmosphere seems to have rubbed off on the performers with a real spontaneity in evidence and the band totally in concert with each other. If you've heard original studio versions of Oldfield's work you'll notice the difference between this live performance and his ultra produced studio recordings. In my opinion the studio recordings often sound clinical whereas in this live environment there is a real warmth and beauty. The musicianship on show here is excellent with Reilly's chanting vocals as sweet and pure as always. She does however seem to lack the enthusiasm of the other performers and I'm not sure if this is standard for her or just on this occasion. Judging by the amount of sweat on Oldfield�s face it must have been a hot stage and maybe Reilly wasn't feeling well. It is noticeable that she retires back stage whenever vocals are not required. ���� It should be noted that during Tubular Bells (Part 1) at 87:45 there seemed to be an editing error or transition with a sudden change in tempo. After repeated playings I was unable to be certain if it was an error or a deliberate change during the concert as the on screen action was centred on keyboardist Tim Cross and there was no jump in the video. A further suspicion was that the bass player had suddenly changed to a rhythm guitar. After comparing with a SACD version of Tubular Bells my conclusion is that it is a break introduced during the editing process for unknown reasons. ���� Despite its flaws this DVD is essential viewing for every fan of Mike Oldfield and progressive rock. The band, and Oldfield in particular, are at their best in this intimate arena and the set list is excellent with the inclusion of rocked up versions of Tubular Bells and Punkadiddle. The recording and production standards are not of the same quality as the performances but are good enough to capture the atmosphere and stage action adequately. ���� This concert was shot nearly thirty years ago and so my expectations were low with regard to the quality of the source material. Unfortunately my expectations were confirmed and it's obvious that little if any enhancements have been done for this transfer to DVD. Overall video quality is poor to fair with smeared colours, blurred outlines, comet trails, aliasing, soft image, low level noise and plenty of grain. There are also some microphony artefacts although these were not frequent. On the positive side there were no tape dropouts or macro blocking, and film artefacts due to dirt were not a problem. Stage lighting was technically not very effective however it was adequate for the type of show being presented. Maggie Reilly in particular takes on a mauve hue much of the time which was a bit disconcerting. I�m guessing that a complete video remastering of the source material is not likely and so this VHS quality version is probably the best we'll see. Because of the age of recording I have not rated the video quality too harshly. ���� The transfer is presented in 1.33:1 aspect ratio and is not 16x9 enhanced. The picture detail was very soft throughout with a VHS type quality (or lack thereof). Macro blocking was not an issue and source film imperfections were not noticed. Most other artefacts synonymous with old analogue recordings were in evidence however. ���� This is a dual layer disc but I could not detect the layer change using my equipment. ���� The default audio track is LPCM 2.0 at 1,536Kb/s. The additional audio options are Dolby Digital 5.1 at 448Kb/s and DTS 5.1 at 1,509Kb/s. After sampling all three tracks I listened to the whole concert in DTS mode because in my opinion it produced a punchier and more spatial sound which suited the source material. The Dolby Digital track was comparable but was recorded at a much lower decibel level. The 2.0 LPCM track was certainly good but the surround encoded tracks better suited the concert experience in this instance. Contrary to the video offering these audio tracks were all of high quality without any problems or issues. ���� The front sound stage was used well with suitable differentiation between left, centre and right channels. Vocals were clear at all times and there were no problems with audio and video synchronisation. Surround channel use was used effectively to supplement crowd noise. The subwoofer was used effectively in the surround tracks to deliver the bass guitar and percussion rhythms. The LPCM track was not as good in this respect. ���� This is a good to very good audio presentation given the age of the source material. ��� The menu featured looping concert video and audio. ����This release appears identical to the Region 1 offering apart from using the PAL format. 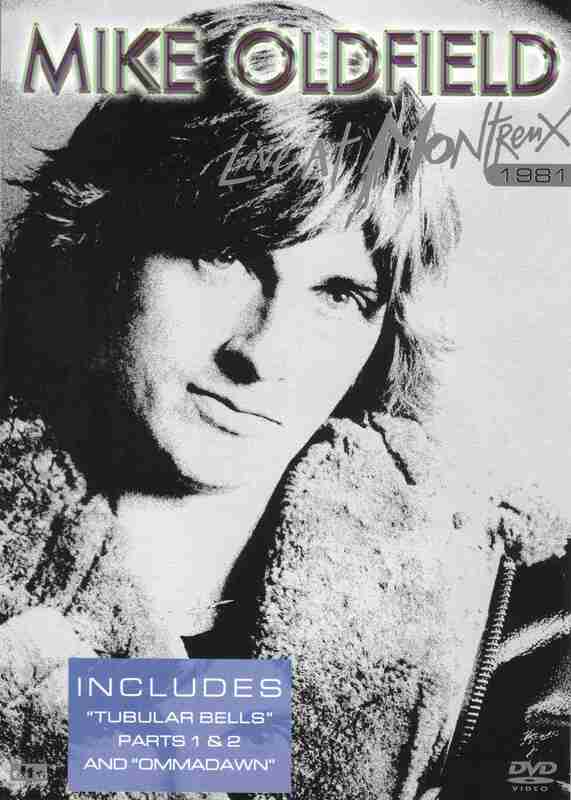 ���� Mike Oldfield Live At Montreux 1981 is a great example from a legendary progressive composer who helped pioneer progressive and art rock. The musicianship on show is excellent with the performers appearing to revel in the intimate atmosphere at Montreux. This is one concert that would really benefit from a complete remastering to the Blu-Ray format - assuming the source material could be cleaned up. Highly recommended. ���� The video quality is fair. The audio quality is very good. There are no extras. Display Panasonic TH-58PZ850A. Calibrated with Digital Video Essentials (PAL). This display device is 16x9 capable. This display device has a maximum native resolution of 1080p. Audio Decoder Built in to amplifier/receiver. Calibrated with Digital Video Essentials (PAL).